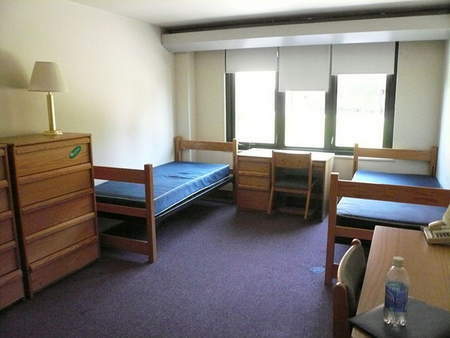 For incoming college students, the month of July is all about dorm shopping! No matter how big or small your new space will be or how elaborately you plan to decorate (or not), you still have some decisions to make, such as how much you plan to bring and which items you can’t live without. Therefore, this month’s edition of The Freshman 15 focuses on the basic necessities of your typical dorm room. — Tweet this! Having lived in both suite- and apartment-style housing, I’ve learned to adjust to various living situations, and I know that the amount of space available in each room really differs by person — so I’ve tried my best to limit this list to the fundamentals. Go on and take a peek… you never know what could come in handy this year! I know, I know — this one seems like a real giveaway. However, one important thing to keep in mind when purchasing your sheets and comforters is that dorm beds come in many shapes and sizes. Most are Twin XL, not just Twin, and you don’t want to get stuck with sheets that are too short for your mattress. Check any information you’ve received from Housing just to be sure. Choosing a bedspread that fitsyour style is also important because not only do you have to look at it all day, but it could ultimately inspire the whole theme of your new room. Some housing communities offer weekly maintenance — but many do not. Regardless of how much space you actually have and can mess up, you should still be sure to keep paper towels, 409, alcohol spray, Febreze, detergent, and dish soap around for when the time calls for them. Unless you have a bathroom all to yourself, chances are you will need to make space for your roommates’ belongings. A great way to do this is by storing your shower essentials in one of these easily accessible caddies instead of taking up the tiny dorm shower in its entirety. This is also great for students who share a bathroom with their entire floor — it’s a convenient way to transport your soap, shampoo, and conditioner without leaving anything behind. Are you one of those girls? You know, the ones with a million pair of shoes for every occasion? I never thought I was, until I started my summer semester of freshman year and realized that my shoes took up the entire closet. My solution for that following fall semester? A hanging shoe organizer. If you attach the organizer to your closet, you can store your shoes in up to ten sections (more, if you upgrade to one of the bigger organizers). Even if you have more shoes than spaces, the organizer helps alleviate some of the space on the floor of your closet. 7. Laundry bag or basket. If you’re anything like me, then your first laundry experience will begin about a week in to your life at college. Chances are, the laundry room will be a short walk away from your dorm room, but you’ll still want a laundry bag that has sturdy handles and can hold a lot of clothes. (Hey, even the best of us get lazy from time to time…) Last year, I purchased a laundry bag with separated sections for darks and lights, somewhat similar to this one. Since the sorting is already done for you, it makes the job much easier. While some dorms do come equipped with kitchenwares (a refrigerator, oven, dishwasher, etc), I don’t know of any that have a microwave already installed. No matter what kind of housing you have, you should consider purchasing a microwave (or at least coordinating with your roommates on this) so that you can cook some of the more simple things — TV dinners, popcorn, and all the other unhealthy staples of a college student’s diet. : ) Check your community’s policies on this, but as long as the wattage isn’t too high, your RAs should be okay with it and you can generally get one for a reasonable price. With textbooks, notebooks, and folders just like in high school, you’ll need something to bring with you to carry your belongings. Some, like me, choose a simple Jansport backpack, while others might want to go a more fashionable route. It’s your choice — just make sure you have something to hold your things! Even if you’re not eating meals in your dorm room, you will still want a place to throw out unnecessary papers and any other unwanted junk you have lying around. If you store it under your desk, it won’t take up any of the space you were really planning on using. 11. Containers for easy storage. If you are living in a small space, you might not have enough room for everything that you want to keep at school. Instead of throwing everything away, you can buy storage boxes and containers to keep everything organized in drawers or even under your bed (which will probably be high off the ground, if you’re living in a Twin XL). One of my favorite purchases this year was a set of small boxes from the local dollar store, which I used to store jewelry, scarves, perfumes, tea, and other items around my dorm. You can also invest in much cuter boxes that match your color scheme, which would mean going to The Container Store (something I have always wanted to do). We all have our own ways of meeting new people and bonding with them. For my first week of college, that “bonding” consisted of a few very awkward and revealing games of Never Have I Ever (I know, very middle-school-sleepover, but still an interesting way to get to know people) and several rounds of Apples to Apples. I am not saying that this game is the be-all-end-all of making friends, but you should try and find something fun to bring everyone closer when you and your friends aren’t up for a night of clubbing or parties. While you may not have a lot of floor space in your new home, most places will allow you to adorn your walls with whatever you choose. A joint dry erase board and bulletin board is perfect because you can write out your daily schedule on one side of the board, and post pictures and reminders on the bulletin side. That way, you can still express yourself AND stay organized. Once you’ve moved in, you won’t want to leave! However, if you plan on visiting friends at other schools or occasionally coming home for holidays and random weekends, you’ll want a bag that’s big enough to travel with but small enough not to take up too much space. Obviously these are all just suggestions, and there are various other items that will come in handy when you move in to your new place. Just make sure to keep in mind the size of the room you’ll be living in, the overall theme you would like your room to exude, and the specific interests and needs that you will have. I’m actually about to head out for some shopping. No problem! : ) I’m glad it was helpful for you and I hope it makes your dorm shopping experience a lot easier! This was awesome, really helpful! Thanks!! I’m glad to hear it! 🙂 Happy shopping! Thank you so much! Dorms didn’t have microwaves when I first started, but I think they are built into more and more dorms and apartments these days 🙂 Glad you enjoyed! enough money. When travelling, for instance, it would be possible to login to your accounting database and enter transactions on the road.